Bishop Babu Masih sitting in Chancel with newly ordained deacons and others. 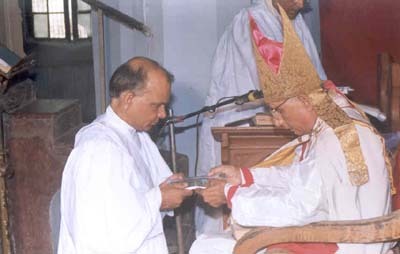 Bishop Babu Masih giving Holy Bible to Rev Isaac Newton Johnson after ordination administering him authority to preach the Gospel. The Holy Orders bishops, priests and deacons are usually refers to the major orders of the ministry in the Anglican and Orthodox Episcopal church. Admission to the Holy Orders is by ordination, the important ceremony being the laying on of hands. It is this which distinguishes ordination to the major orders from that to the minor orders. In the former the minister of ordination is always the bishop, but the minor order may some times be conveyed by others. 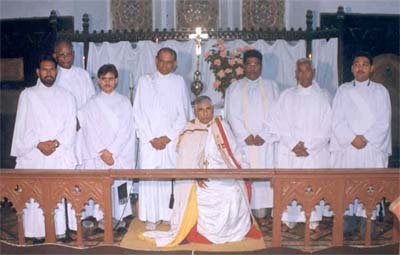 By the Divine permission The Right Revd Babu Masih, Bishop of Amritsar Diocese, Anglican Church of India has ordained five CATECHISTS as DEACONS in the Name of Father and of the Son and of the Holy Spirit on 29th September, 2002 at St. Lukes Church, The Mall, Jalandhar Cantonment India. These CATECHISTS are 1. Rev Deacon Rashid Masih who had been working in Church of North India for the last more than 25 years in Christ Church and School at Jandiala Guru, District Amritsar. 2. Rev Deacon Basil Ivan Chand who has completed three years of seminary from Dehradun. 3. Rev Deacon Amrik Masih who had been serving as Catechist in Anglican Church, Kotha near Dera Baba Nanak under Archdeacon Ashok Kumar for the last more than 15 years. 4. Rev Deacon Pankaj Kumar who is running Christian high school and hostel at Gomtala, District Amritsar and also preaching the Word of God for the last so many years. 5. Myself Rev Deacon Isaac Newton Johnson, the most least servant of the Lord Jesus Christ completed my Degree in Bachelor of Divinity from International Theological Open University, Sri Ganganagar, India in February, 2002. I am Anglican teacher since 1969, teaching typewriting & shorthand and an evangelist, freelance journalist and international media missionary since 1976. After my ordination as Deacon The Right Revd Babu Masih has very kindly appointed me as SPOKESMAN for Diocese of Amritsar, Anglican Church of India to speak on behalf of Diocese of Amritsar and to make correspondence with higher Church authorities about the activities/Church projects inside and outside India. While my heart is filled with gratitude and praise to the Lord God of Israel in the very highest, I give my thanks to my honorable Holy Order Right Rev Bishop Babu Masih for his trust and responsibilities he put on my shoulders in the Diocese of Amritsar. I pledge to fulfill them with utmost care and sincerity. At this moment of joy and praise, my thoughts go back to my grandfather Chaudary Naneh Mal Singh who was converted to Christianity from conservative Hindu family in 1890 by British Methodist missionaries in Muradabad, U.P. India. He joined British Royal Army and fought Great World War I in 1914. He was the receipent of Princess Mary Gift Medal 1914 as a soldier on front. He was murdered by his Hindu brothers in 1920 for not to share huge family property with him. Thus my grandfather fought for the physical survival of the then Great Britain and died for his Christian faith. Now I am his grandson fighting for the spiritual survival of Great Britain as international media missionary where every week one Chapel or Church is being closed or turning in to restaurants. Please do not cease to pray for me and my above colleague Deacon brother's ministries. The above article published on 15th October, 2002 issue of Masihi Sansar (Christian World) newspaper. Freddi Joseph, Chief Editor “Masihi Sansar” (Christian World) Newspaper, Lamba Pind, Jalandar, India.